Root class for algorithms that has shape as result. The class provides the History mechanism, which allows tracking the modification of the input shapes during the operation. It uses the BRepTools_History tool as a storer for history objects. 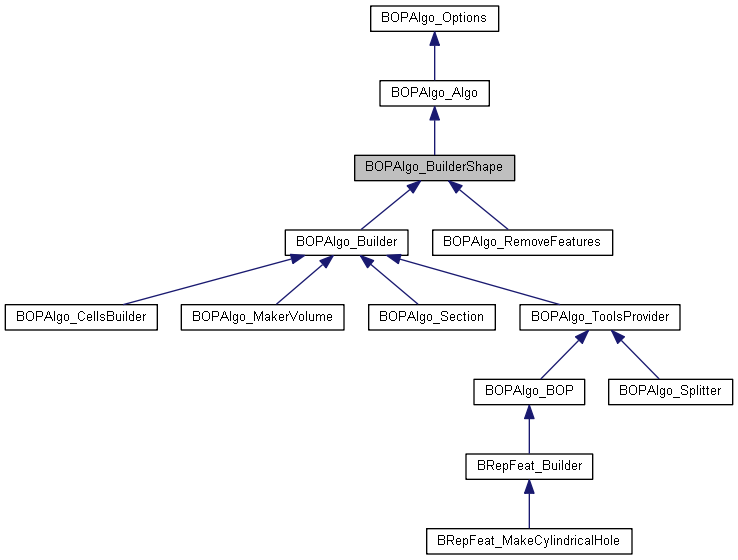 Reimplemented in BOPAlgo_RemoveFeatures, BOPAlgo_CellsBuilder, BOPAlgo_MakerVolume, BOPAlgo_Builder, BOPAlgo_BOP, BRepFeat_Builder, and BOPAlgo_ToolsProvider. Returns the list of shapes Generated from the shape theS. Returns true if any of the input shapes has been deleted during operation. Returns true if any of the input shapes has generated shapes during operation. Returns flag of history availability. Returns true if any of the input shapes has been modified during operation. Returns true if the shape theS has been deleted. In this case the shape will have no Modified elements, but can have Generated elements. Returns the list of shapes Modified from the shape theS. Allows disabling the history collection. Returns the result of algorithm. Storer for the history shapes. Cashed map of all arguments shapes.